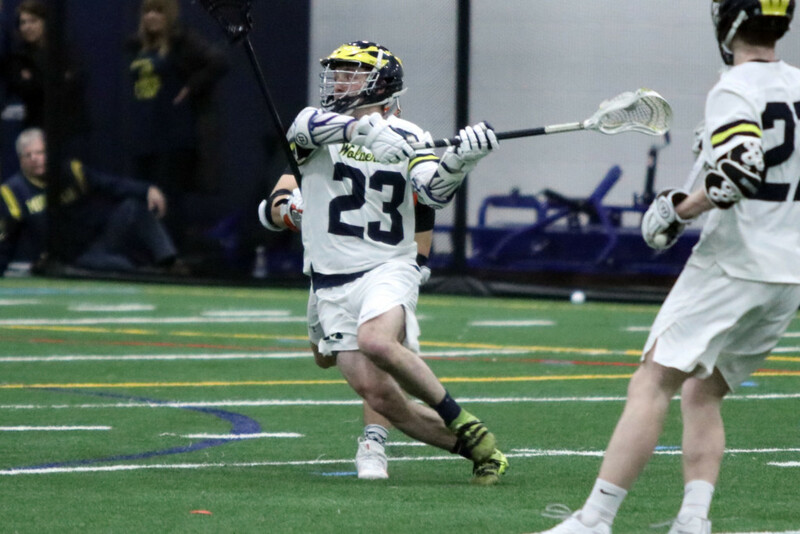 The UM-Dearborn men’s lacrosse team played their first game of the season Saturday night at Detroit Country Day Fieldhouse in Beverly Hills. It was a back and forth contest but the Wolverines won the game 13-11. The Wolverines took on the Kalamazoo College Hornets and it wasn’t an easy game. It was obvious there were nerves at play for both teams because both teams were hesitant on plays as the first period came to a close with the Wolverines leading the Hornets 2-0. “We had a little bit of jitters in the first quarter and a little bit of a track meet. We settled down and started to get into a rhythm and started to work on the little things” Watts said. The Hornets and Wolverines would add on two goals each in the second period making the score 4-2 going into halftime. The Hornets seemed to wake up midway through the second period as their intensity and speed increased and pressing the attack. The second period also saw junior Nolan Landis go on a fast break from deep in the Wolverines defense to fly up the sideline bull, rushing over a couple Hornets in the process. The Hornets outscored the Wolverines in the third quarter, scoring six goals to the Wolverines three. This gave the Hornets the 8-7 lead going into the third period. The Wolverines found their stride early in the fourth with six goals scored to the three scored by the Hornets. The scoring was led by one of last season’s leaders, sophomore Devon Callaghan, who scored two of his three goals of the night in the fourth quarter. The surprise of the night was the play of freshman Adam Ranck, who also plays on the UM-Dearborn hockey team as a goalie. Ranck, an attacker, showed what he will bring to the team by scoring two of his four goals in the game in the fourth period. The Wolverines also received goals from senior Matthew Rosteck (2), senior Mitchell Stapleton (1), sophomore Ben Phillips (2), and junior Justin Brodzik (1). The Wolverines also had assists by Matthew Rosteck, freshman Chad Reynolds, and Justin Brodzik. The Wolverines won the shots battle with 44 shots. 25 of the shots being on goal compared to 36 shots and 19 on goal by the Hornets. The Wolverines had 41 ground balls and won 15 face offs. The Wolverines will now travel to Barbourville, Kentucky, to take on Union College on Saturday afternoon and to Williamsburg, Kentucky on Sunday to take on the University of the Cumberlands. The Wolverines are now 1-0 early in the season. Check back with the Michigan Journal for all updates on the UM-Dearborn lacrosse team.